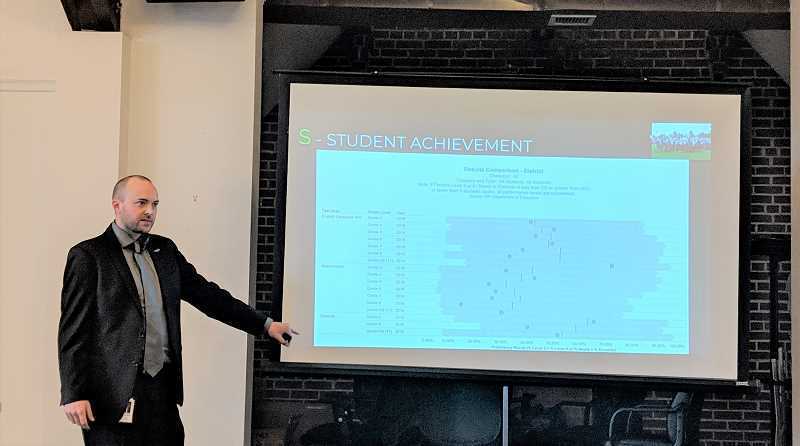 Superintendent Ryan Carpenter shared these accomplishments and others pertaining to the district's progress on its strategic plan during a meeting of the Estacada Chamber of Commerce on Thursday, Jan. 17. The plan focused on student achievement, effective communication and engaging families. Carpenter shared several highlights from the 2017-18 state testing results, including Estacada High School's 11th-grade English Language Arts score being at an all time high of 86 percent of students performing at or above grade level. Additionally, fourth-grade English Language Arts scores rose from 51 to 61 percent, and scores from the same group at Clackamas River Elementary School rose from 17 to 50 percent. Sixth-grade English Language Arts scores at Estacada Middle School were at 49 percent, which is the state average. "The directions where our kids are going are absolutely in the best way," Carpenter said. He noted that a significant factor in supporting student learning has been collaborative group work among teachers . "We want to equalize opportunities," he said, so that students have "the same opportunities and experiences no matter what teacher they have or building they're in." He described last year as an "all-out blitz" to achieve this goal, and noted that teachers meet during Wednesday early-release days to collaborate on student progress. "High-stakes education requires more people to tackle the problem together," he said. The school district is also taking strides to improve communication, including using social media in new ways. He described Facebook Live town halls as "the most effective thing we've ever done before," adding that the first one received 905 views. Carpenter noted that "two huge areas" in which the district is able to engage families are Friday night football games and the family breakfasts that are held at Clackamas River and River Mill elementary schools. The district's priorities in this area include frequency of communication, student involvement and a focus on underserved families. Carpenter also shared that the school district partnered with Patinkin Research Strategies to conduct a survey to "check the temperature of where the community is at." In November 2016, 54 percent of Estacada voters said no to a $55.1 million general obligation bond, while 45 percent supported it. In December, 400 registered voters in the Estacada School District were polled about a $20.4 million general obligation bond to increase safety, repair schools and facilities and update technology. When asked if they would support this if the election were held today, 46 percent said no, while 45 percent said yes. because they were "so partisan." He also polled other projects that could be included in a bond, such as adding cameras and upgrading security features, replacing inefficient boiler systems, adding air conditioning to school buildings and modernizing the high school to include updated technology, a computer science lab and vocational training opportunities. But voters polled still remained hesitant to support a bond.